In the heart of each restaurant is the kitchen. Due to the fact that there are plenty of kitchen layout options to choose from, some business owners often end up confused or struggle to choose the right kitchen layout to satisfy the needs of their restaurants. The truth is that a well-organized kitchen is one of the most important prerequisites for running a successful restaurant. In order for owners to ensure the seamless operation of their business, they should spend sufficient time on the careful planning of their restaurant’s kitchen design. This comprehensive article includes all the important information that restaurant owners should consider when designing or remodelling a restaurant kitchen. In the next few lines, you will find practical tips and useful ideas for the best way to utilize your kitchen space and significantly optimize its functionality. Why is a restaurant kitchen design so important? Many restaurant owners make the mistake to underestimate the importance of their restaurant’s kitchen design, thinking that it is more important what is cooked, rather than where it is cooked. An undeniable fact is that the quality of the food and the experience of the chefs are essential for a restaurant’s success. But the truth is that they are a consequence of a functional kitchen space, great management, and an organized and streamlined process. If you are not able to offer a fully functional, modern workspace, you can’t afford to attract the best talents. Don’t forget the fact that good chefs are demanding chefs. If they want something in the kitchen to be reorganized or remodelled, it is because they have an idea how this will affect the inside operations such as shorter food preparation time, easier workspace navigation, comfortable working conditions, etc. And better kitchen functionality means satisfied clients and higher food quality. The goal of the whole process is to make your chef and the rest of the kitchen staff feel comfortable and ensure everything that they need to handle their tasks seamlessly. 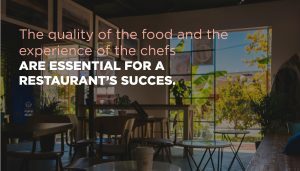 Don’t forget that your chef is the one who will run the kitchen and who, presumably, has experience in different types of kitchens to know what the best option for your restaurant is. So, basically, the chef is the one who should have the final word when your design consultant/architect offers different design concepts. If you don’t involve your chef in the process, you risk facing situations where your kitchen does not have enough space or you spend unnecessarily on the wrong equipment. Different types of cuisine require different equipment, kitchen space, and organization. That is why, before jumping into kitchen design, you should, first of all, refine your menu ideas. 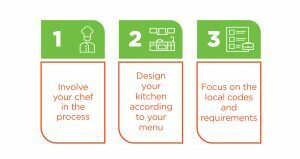 If your restaurant is already running and you do not intend on changing your menu, then redesigning the kitchen to refresh it or increase its efficiency will not require so much initial planning. On the other hand, if you are starting from scratch and wonder what kitchen type suits your business concept best, then you should once again, discuss the matter with your chef. Once you are quite sure what meals will be included, you will be able to figure out the steps needed for their preparation, thus the most appropriate type of kitchen equipment and organization for your project. Local authorities’ employee safety protocols, health, and fire codes are crucial not only for the safe operation of your kitchen but of your whole restaurant as well. Check the regulations of your local state authorities and make sure to comply with all of them. Otherwise, if you start designing your kitchen without taking into consideration specific requirements such as the way the vents are installed, where your food storage areas are located or the appropriate distance between the different food preparation stations, you risk facing unnecessary difficulties in the future operation of your business. Do not forget to check the food codes, issued by the FDA as well. They consist of scientifically-backed legal basis that local health departments use for regulating the retail and food service segment of the industry. Making sure that your restaurant is in compliance with the local food standards and can successfully pass a sudden check by state authorities is crucial. In order to avoid any future problems and regulation-related issues, the best thing to do is to arrange an appointment with a state inspector. Do it when you are in the process of planning your future kitchen so that you can get timely information and avoid spending on redesign or remodelling works. There are a lot of things to consider when you are about to start building your kitchen from scratch or handle some design and remodelling works. If you are working with a professional commercial kitchen designer, you may not need to think about all of them. Yet, it is always better to be aware of what to expect and what to consider for such a project. One of the first things to think of is the kitchen’s organization and flexibility. 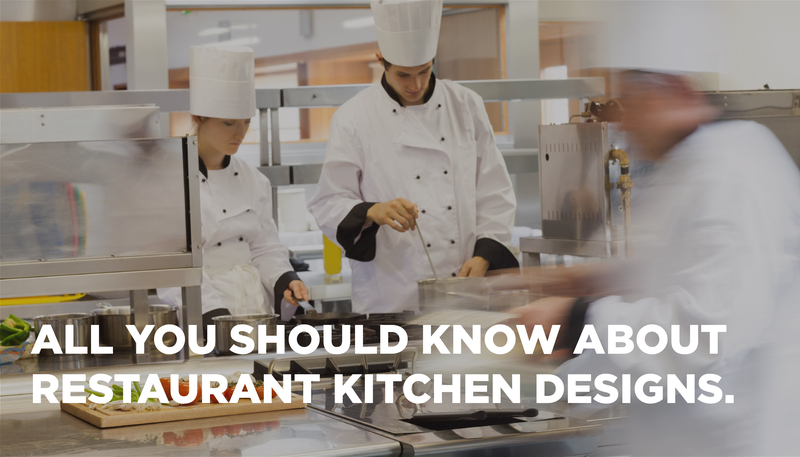 Depending on the type of your restaurant, whether it is a quick-service or a fine dining one, you may need a specific type of kitchen layout. Some restaurant owners prefer installing mobile equipment that can be rearranged depending on the workflow. Make sure to keep your kitchen as simple as possible and avoid cluttering it with unnecessary equipment. Do not forget that the most important thing in your kitchen is the efficiency of the workflow. The more flexible the premise’s layout is, the more productive the work process you can expect. Another important part of a good kitchen’s design is having comfortable washing and food preparation stations. When thinking about the layout of the premise, bear in mind that, if not planned well, these processes can be very time-consuming. All this will result in extended time for cooking the meals, which will harm the overall customer experience. Last, but not least, make sure to focus on the kitchen’s energy efficiency. Restaurants’ kitchens consume a lot of energy, which if not planned well, will result in unnecessarily high costs. Ask your designer how to optimize the kitchen layout, so that you can reduce your energy bills. For example, installing energy-efficient air ventilation units at crucial locations around the premise, while also ensuring their continuous maintenance can help you retain the comfortable indoor climate and cut on energy costs. It is no secret that having a well-designed kitchen will increase the efficiency of your operational processes and will keep your staff satisfied for the long term. And the path to having a well-designed kitchen starts with defining the type of your restaurant as different restaurants require different types of kitchen layouts. This type of kitchen layout separates the different food processing areas in a way that forms a line. Before being served, the meal passes through all the areas, so that it can get through the required phases – from raw food preparation to cooking. Typical for this layout is that most of the time, the staff remains static, while the meal is transferred from one kitchen member to another. Due to the fact that such a workflow organization significantly speeds up the process, the assembly line is often considered the natural choice for quick-service restaurants. The serving of the meal usually happens in front of the client and he can instruct the cook about how he wants it prepared and what specific ingredients to be included. After the meal is ready, the client pays for it at the end of the line, usually via a POS. 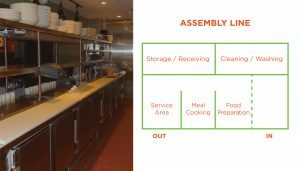 The assembly-line kitchen layout is a popular choice for restaurants that process large numbers of orders for a very short period of time – QSR, state facilities, etc. Due to the efficient workflow, it is also used in restaurants with limited items in their menu (a pizza place, for example), where the cooking process is kind of monotonous (each day, one and the same recipes) and has to be handled quickly. The assembly-line type of kitchen layout provides workflow efficiency, easy communication and minimum waiting time for customers. 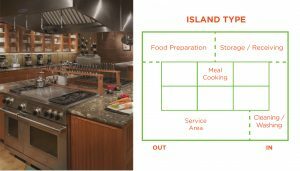 Designing a kitchen in an island-type layout means that the main points of reference (ovens, grills, fryers and other cooking equipment) are placed in a large block in the center of the premise. Food storage and preparation areas, such as fridges, washing stations and secondary food equipment like robots, blenders, etc. are placed on the perimeter of the kitchen. That way, the workflow is divided into two main stages – food preparation, that takes place in the corners and the sides of the premise, and cooking, that is focused in the center of the kitchen. This helps chefs pass on the food to each other easily, as they are all placed in the center of the room. The island-type layout is often preferred as it prevents chaotic situations where members of the staff intercept each other’s work and disturb the overall workflow. One of the main benefits of this type of kitchen layout is the fact that it promotes open and flexible communication, while at the same time, ensures easier movement and plenty of space. That way, the executive chef, who is responsible for the smooth execution of the whole cooking process, can easily move around the kitchen and the island in the center and monitor the workflow to prevent mistakes or provide suggestions. 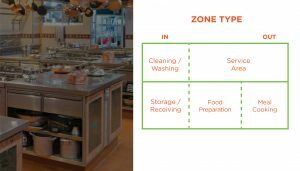 A zoned kitchen layout basically means that the premise is separated in different zones that follow a logical sequence – for example, from storage zones and washing stations, through raw food preparations, to cooking and plating zones in the end. The major equipment is placed along the walls which leave the center of the premise open. The kitchen staff on each zone have their own responsibilities and tasks. 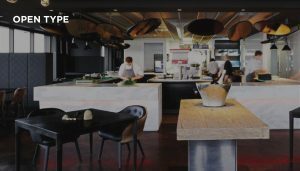 Because of the fact that the zone-type kitchen layout forms something similar to a chain, the cooks should be able to work as a team, so that the whole process goes smoothly and without any delays. If some of the nodes in the chain cannot keep up with the pace of the workflow and unintentionally slow down the whole process, another crew member can join and help them keep up. The zone-type kitchen layout is often preferred due to its flexibility and the ease of staff movement across the kitchen. Zone-type kitchens are easily modified and can be transformed according to the size considerations of the specific project. In the recent years, it has become very popular for restaurant owners to highlight the cooking process and to build the whole visitors’ experience around it. This is how open kitchen layouts were born. Making the food preparation a focal point in the whole restaurant has proved to be very satisfying to customers. By being able to see how their meals are being cooked, clients are basically becoming a part of the whole process and their after-work-dinner is turned into an amazing experience. Open type layout designs are popular for fine dining restaurants where exotic meals are served. The chefs are separated from the clients only by a glass and a serving area. This often motivates them to not only cook delicious food but to do it in an authentic, memorable and aesthetically-pleasing ways. This is a great choice for those restaurant owners, who do not have enough space to design a kitchen layout like one of the abovementioned. The truth is that the size of a kitchen is sometimes irrelevant to how functional it is. There are plenty of examples where large commercial kitchens operate way too inefficiently when compared to competitors with fewer resources and minimalistic layouts. If the workflow is optimized and organized in a suitable way, a minimalistic layout can work as efficiently as the kitchen of a big fine dining restaurant. Some restaurant owners even reach for designing flexible and customizable kitchens. By focusing on ergonomic kitchen design, they can significantly optimize the space and drastically improve the overall comfort of their small place. Ergonomic layouts are based on the idea that each member of the staff should be able to handle his tasks with as minimum efforts and as quickly as possible. Restaurant owners can maximize the utility of their kitchens by installing moving walls or appropriately-located equipment. For example, by using an under counter freezer that is placed right beside the deep fryer, the cook can process the food with little-to-none effort. 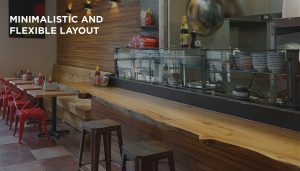 Yet, ergonomic kitchen layouts are considered as a not-so-cheap solution, due to the specific design considerations that should be taken in mind when tailoring the premise according to the stage of development of the restaurant. The kitchen is considered one of the biggest investments when opening a restaurant. In order to find the most cost-efficient solution, a restaurant owner should focus on careful initial planning by making accurate projections about the menu items, the required staff, the maximum expected workflow, and other similar key factors. No matter how good a restaurant’s location or how cosy its interior is, if it is not able to satisfy its clients by offering them delicious food in a short amount of time, it won’t turn out successful in the long term.